Dashbot recently surpassed 70 Million messages processed. One of the questions that comes up often is around buttons — what’s better — free form input or button driven interfaces? We took a look at the data across Facebook bots on our platform for the past three months. Keep in mind this is looking across all the bots, not segmenting based on industry vertical or specific usecase. At a high level, what we found is a mixture of buttons and quick replies are good, but too much can have a negative effect on engagement. 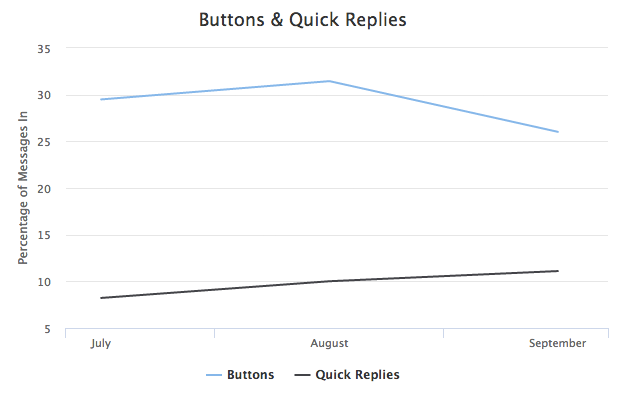 Looking at the data over the past three months, the average percentage of messages into a bot that are buttons has recently dropped, while the percentage of quick replies is steadily rising. The average button percentage went from 29.5% in July to 31.5% in August and down to 26% in September. Meanwhile, quick replies have increased from 8.2% in July to 10% in August and 11.1% in September. What’s Better — Click or Chat? In regards to Buttons and Quick Replies, like anything, in moderation they are great, but too much can have a negative impact on engagement. If we look at Buttons and Quick Replies together, we see the average percentage of messages into bots of those two types combined, over the three month period, is 34.8%. In fact, once you get over ~60% of your inbound messages being a combination of buttons and quick replies, sessions per user per month, starts to drop off quite a bit. Time per Session in both extreme cases drops off a bit, and Messages In per Session increases as the the percentage of buttons and replies increases. One of the beauties of conversational interfaces is the ability to send in unstructured data — images, videos, button clicks, and more importantly a user’s own voice — their own words telling you what they want from your bot and what they think of your bot. If your bot interface is heavily button and quick reply based, make sure to check the other message types coming in as your users may be providing valuable information that could help you improve the overall bot experience. Dashbot has tools to filter the types of messages coming in to give you a better idea of how users are interacting. With this information, you can add additional handling to improve the experience for your users. More importantly, we provide tools that make use of the data to improve acquisition and engagement, like live person take over of chat sessions. Previous PostDashbot: For the Love of Bots!